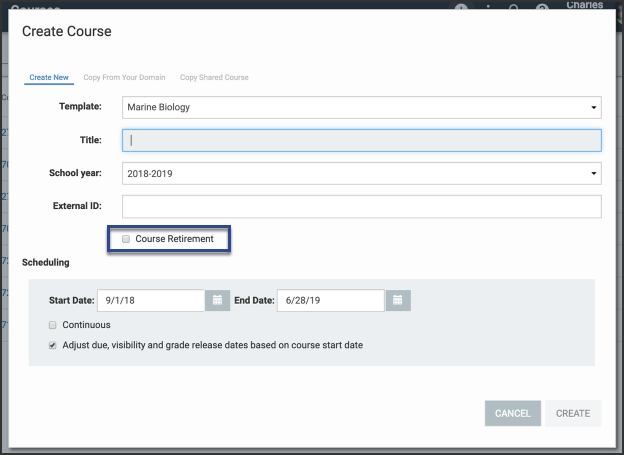 Create metadata fields that allow you to record and track additional information about a course. Click Add on the Metadata for courses card. Input Type: This specifies how you want users to provide the metadata. Different input types require you to provide different information on this window. 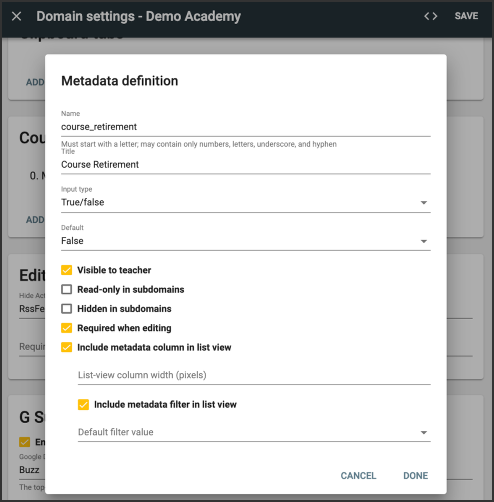 Visible to teacher: Check this box is you want teachers to be able to record and change Course Metadata. If you don't check this box, the field is only visible to admins. Read-only in subdomains: Check this box if you want the metadata to appear in subdomains, but not be editable. Hidden in subdomains: Check this box if you don't want the metadata to appear in subdomains. Required when editing: Check this box if you want the field to be required. Indicate the List-view column width (in pixels). Indicate whether you want to Include metadata filter in list view and, if so, provide the Default filter value. If you do not specify a value, then the list is not filtered by that metadata field. Where do Course Metadata fields appear? Which screens are impacted by enhanced Course metadata?